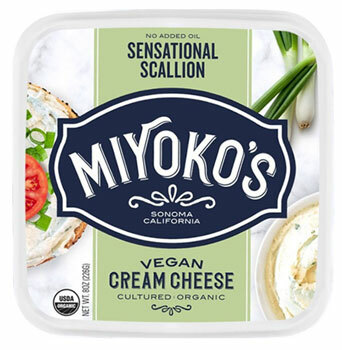 Sensational Scallion Vegan Cream Cheese is a thick, savory, cultured cashew cream cheese speckled with green scallions. Great on bagels, crackers, cucumber slices, or canapes. With a creamy, rich flavor, it's perfect for crafting the ultimate appetizers for your upcoming party, too! Made with organic and non-GMO ingredients, this cream cheese is also free of cholesterol, lactose, gluten and soy. 8 oz. (226g) containers are $6.99 each.